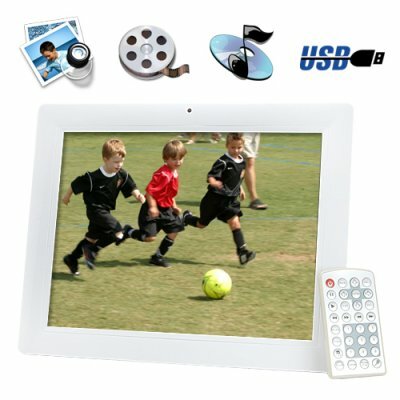 Successfully Added 12 Inch Digital Photo Frame w/ Remote + Media Player (2GB) to your Shopping Cart. Digital Photo Frame with picture, music and video playback. The 12 inch multimedia display featuring a silky smooth slideshow function along with a static (fixed) display for your favorite photos. Store your media in this unit's 2GB internal memory or simply insert a standard flash memory card (SD/MMC/USB) with your digital files to start enjoying them at their very best on an incredibly crisp LCD screen. With sound output provided by two high quality built-in stereo speakers, the electronic picture frame will also playback popular multimedia content such as DIVX with its on board media player. You can even combine your photos with your favorite music playing in the background. This is a popular way to relax and unwind, by combining your most cherished digital photographs along with accompanying music to create a rhythmic multimedia slideshow. Convenient, with a user-friendly interface and unlike a traditional photo frame, enjoy more than one photo at a time with the added multimedia functionality of digital audio and video. Give each photo and your precious memories the special attention they deserve by displaying them on this crystal clear 12 inch TFT LCD screen with its vibrant colors. This electronic photo frame would be the ideal choice for those with large photo collections and for those who enjoy taking and showing off their photos. Use it in your home for family and friends to enjoy, place it on your home nightstand for personal photos, have it located in the kitchen with your favorite photos or use it in the office for co-workers to see your vacation photos - the choice is yours! Sized to fit comfortably on your desktop while at the same time being big enough to enjoy if you place it on a further away bookshelf, this is the one Digital Photo Frame to get if you want to get a truly special gift for yourself or the one you love! The best part is that it is available in our warehouse right now for single piece or large stock orders and it is being offered at an exclusive factory-direct wholesale price. Place your order now and we will express ship it out to you tomorrow! Works with SD cards and USB thumb drives! Plays MP3, AVI, DIVX, and XVID! Includes full screen calendar, clock, and picture in picture photo slideshow. Upgraded thinner design with ergonomic control buttons and built-in frame stand. How many pictures can this Digital Photo Frame hold? The number of photos this digital photo frame can hold depends both on the size of the memory card you insert in the Photo Frame as well as on the size of the image files themselves. This model can support memory cards up to 16GB capacity. If you consider that a good quality photo is roughly 200 KB in size, roughly 80,000 pictures could fit on a 16GB SD card. That's a lot of photos! As for the 2GB internal memory, you could fit roughly 10,000 photos. How quickly does the digital photo frame cycle through images? You can adjust the rate to every 3, 5, 15 seconds or 1 , 15 minutes, or hourly. You can also display just picture like a conventional photo frame, but where would the fun be in that? How do I load my pictures on to the Digital Photo Frame? Simply put your pictures onto a SD/MMC card or USB key and plug it in. That's it! The Digital Photo Frame will detect and cycle through your images automatically.